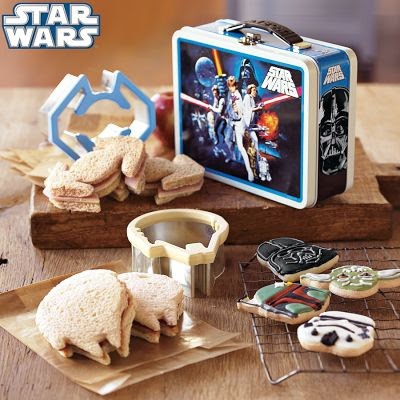 A couple of weeks ago, sweet blog reader Beth sent me an e-mail to let me know that Williams-Sonoma had its Star Wars sandwich cutters on sale. I went and checked it out, and sure enough, it looked like a good deal. (Thanks, Beth!) I already have the pancake molds, so these were great companions to add to our collection. made a [pretty passable] COOL sandwich! Does mine look as good as the one in the promotional photo? No, it does not. Did I make another one to try to do a better job? No, I did not. I simply moved on to the Tie Fighter. It came out slightly better, although it's not fantastic, either. But you know what? The boys didn't care. They loved them! Note: We arrive at the beach today, so this week will be heavy on beach-related posts. Not sure how many I'll have time to write, but I'll do my best! You're going to need a barbie sandwich cutter soon! My girls like Star Wars, but not that much!! Oh yeah!!! I'm so glad you got them!